This is an easy and yummy recipe that make a wholesome meal with dahi or raita. At my home, this is also called "Colorful Vegetarian Biryani". It is tasty and amazing combo of flavours, color & taste in one dish. 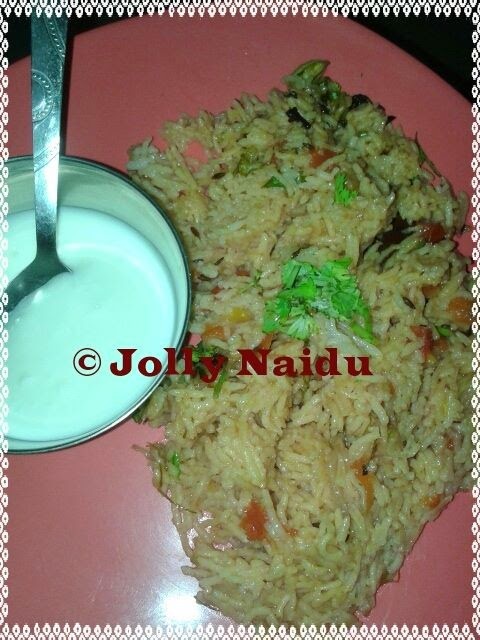 Behind the story of this Pulao recipe, I want to share it with you all : First time I tasted this pulao recipe at my husband hometown, Nagpur, its taste is typical spicy Maharashtrian style pulao but I don't like spicy food, so I didn't liked it. Second time, I tasted it in Bangalore, again disappointment is there with pulao like more spicy and lots of spices inside the pulao , which I feel not good for us. Then decided that I made this rice at home with my own style...I already tasted so get to know about herbs and spices, In this I used two fresh herbs which is going very well with this rice. I always said "Happiness is in Homemade Food - tasty, simple and less spicy". You can add vegetables also in pulao as per as your choices. The long grain aromatic basmati rice is cooked in tomato, onions with herbs & spices. This is delicious Indian recipe, you can served as a side dish in your small party and get together also. I like it very much and even my husband also....he just loved it. This is the perfect meal for the day. I hope you'll all liked my recipe...Your views are welcome !!! 1. Heat oil+ghee in a pressure cooker, add shahi jeera, cloves, cinnamon and cardamoms and stir fry for 30 secs. 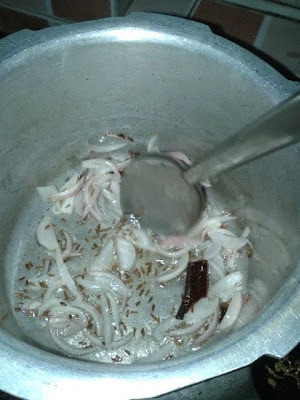 Now add sliced onions and saute for few more minutes. 2. Add bay leaf, chopped green chili, ginger-garlic paste and saute for few seconds till ginger-garlic paste is cooked well. 4. Add red chili powder, cumin powder and mix well . Add chopped tomato, tomato puree and salt to taste and mix. Cook for 8-9 minutes on low to medium flame, or till oil separates. 5. Reduce the flame, add the rice, mix well with cooked masales with a very light hand make sure that rice is not cracked, saute for a minute. Add 3-3/4 cups of water and bring to a boil. Using pressure cooker, closed the lid and cook rice up-to 3 whistles. 6. 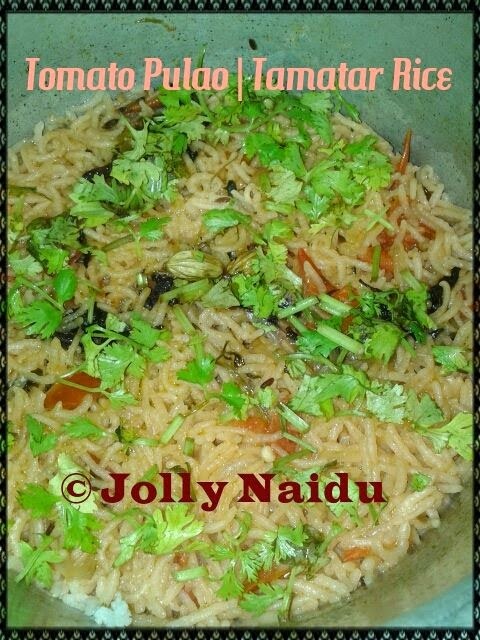 Your Tomato Pulao is ready to eat. Remove onto a serving bowl. 7. Garnish with fresh coriander leaves. Serve warm with cucumber raita, dahi or any curry of your choice.